There are few cities in the world that match Prague’s resume. Historically relevant, beautiful architecture, warm weather, cheap beer and delicious national dishes, Prague has long been one of the most appreciated cities in Europe. A long history of the arts runs through, from architecture to sculpture and a deep appreciation to its people emirates from the city. Prague's locals are fiercely independent and friendly, with most of them capable of giving a full tour of the city without any training. It's an infectious attitude and one that leaves most travellers with a sense of holiday blues after they leave. A truly glorious city, with some of the best views in the world. Follow this guide to ensure you don’t miss out on some of the best photo ops in Europe! 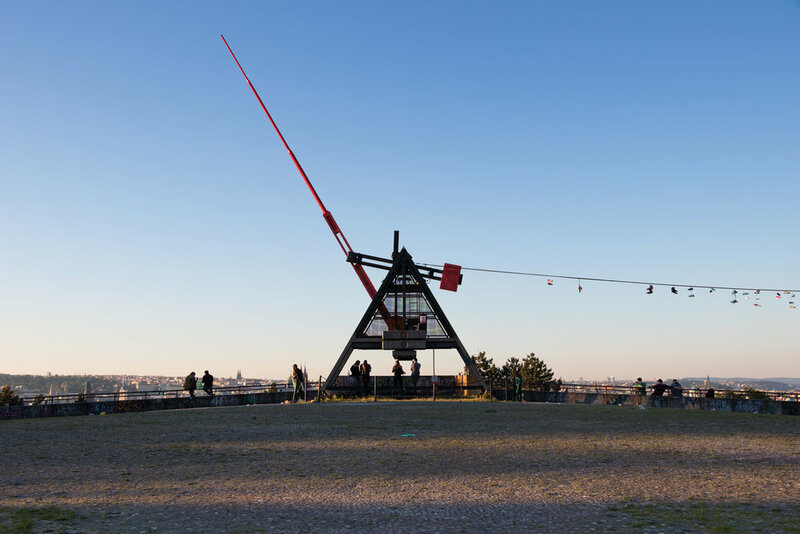 Located in one of the many parks that dot the hilly Prague landscape over the river, the Prague Metronome has some of the best scenic views of Old Town Prague. A short walk up a stone staircase leads to the outlook, which has several stone walls perfect for framing and posing upon (careful of the edges!). At the top of the hill, a replica sculpture of a large metronome sits, an odd juxtaposition between man-made and natural gardens. Directly behind is a bustling skate park, covered in graffiti for those with an eye for more of an urban aesthetic. Prague is famous for its pilsner, but if you want to truly enjoy it you need to be outside, in the sun, taking in the sights. Nowhere is this truer than the Letná Zahradní restaurace. A small, wooden cabin serves all manner of food and beverages, while long wooden tables sit under a leafy canopy of ancient trees. On the crest of a hill, Letná Zahradní has fantastic panoramic views of the city, a gothic museum and plenty of space to set up shots. Essential for any traveller, as the pilsner is 100 times more delicious when taking in the view. The ancient seat of power in Prague, this imposing structure is visible from almost anywhere in the city. Perfect for vista shots but also beautiful from inside, the castle is worth the trek up to for the views and for a chance to walk around the structure (there is an admission fee). The current residence of the president, this 9th-century castle is in close proximity to one of Europes oldest running vineyards in Villa Richter. Perfect for a drink and a bit to eat, or a stroll through the grounds. The stone bridge linking Prague's new and old town. Decorated on all sides by beautiful sculptures, some of the best in the city, it offers fantastic reviews to some of the best sights in the city. Aside from watching boats traverse the river, or admiring the buildings that dot the river bank, views of the castle and clock towers are available. Filled with buskers and street vendors, there is plenty to see and do along the Charles Bridge. Situated near the French embassy, this once ordinary wall has long since been dedicated to politically focussed graffiti. Named for John Lennon, the messages here are comparable to that of the Berlin wall, often political, satirical, or heartfelt messages. Colourful as it is, it can be easily missed and must be sought out. The lookout tower is accessible by rail cart or (for the brave) by foot, up a long winding hill that is flush with dedications to the 12 apostles. Atop is the best views of the city. For a small fee, one can enter the tower, which is taller than the Eiffel, and get some of the best panoramic views this writer has seen. The only place to get a complete view of the city, Petrin Hill itself is green and leafy, with several decorative churches and an observatory also located. The most famous landmark in Prague, with the best architecture and best food. Two of the cities most iconic structures, the Astrological clock and the Old Town Hall, are both located here, offering stunning views of Czech architecture which somehow manages to be both imposing and beautiful simultaneously. Several tree covered areas dot the square, a necessary respite from the sun during hot days and a shady place to plan your next shot. Sculptures and fountains abound, and if you’re lucky you might get asked to take a photo for one hapless traveller (e.g. me). Another of Prague's many scenic lookouts, this path runs along the edge of one of Prague's tallest hills. Views of old and new town, plus the river bend, are available. On top of this, a beautiful cafe offering delicious food can be found, with outdoor seating that rivals the fare. One of the oldest districts in Europe, Prague's old town is filled with architecture that suggests a lot of wealth. Grand cathedrals and churches, huge domes and large avenues are in abundance, as walking the streets quickly becomes a favourite pastime of many travellers. Filled with charming cafes and bars, Old Town is also home to a number of the cities best attractions and gorgeous buildings, including the smallest house in Prague and a number of synagogues. Known as ‘lesser town,’ it is anything but! A hidden gem within the city, filled with twisting roads, cute homes, large gardens, villas and the occasional canal. Easily missed, this district takes a bit of walking to fully appreciate. Take a wand down a side street and you are just as likely to find a glorious mural as you are to find a waterway that looks stolen from Venice. One of the many city gates that were restored following the Battle of Prague, and easily the most impressive. These imposing structures are spread out over the city and are great photo ops, as they show some of the oldest architecture in the city and are reminders of when Prague was a world power.